← Do you Speak Bond-ese? The global economy flamed out in 2008. Leading economies in Europe and the U.S, having enjoyed a burst of debt-fueled growth, then suffered a collapse in GDP, which we now know was worst than first thought, and which totalled about 6% of GDP in the U.S. Basic Keynsian macroeconomics says that when GDP falls that far and fast, and private spending shows no sign of making up the gap, one has to fill that gap with government spending to restore normal economic activity. A stimulus of government spending that would fill that gap would have been about $840 billion per year. Since the stimulus bill in the U.S. was publicly pegged at $800 billion, it should have worked, but it didn’t. So Keynsian economics is clearly wrong, right? Well, the good of counting, as Samuel Johnson says, is that it replaces vague belief with firm certainty. Except that you have to be careful what you are counting. The $800 billion stimulus bill contained $100 billion of AMT extensions that had been automatic and were expected anyway, so can’t really count as fresh spending. The other $700 billion was spread across two years, so was really only $350 billion per year. That means the actual stimulus spending came in on an annual basis at about 2.5% of GDP per year — less than half of what was needed to get growth back on track. The stimulus WAS sufficient to stop the decline, so the economy stopped shrinking and employment stopped falling every month. But the economy did not fully recover to earlier levels and unemployment instead went to flat-line (jump out a window, somebody puts a board out to catch you, you stop falling; but that’s not enough to get you back to where you started). 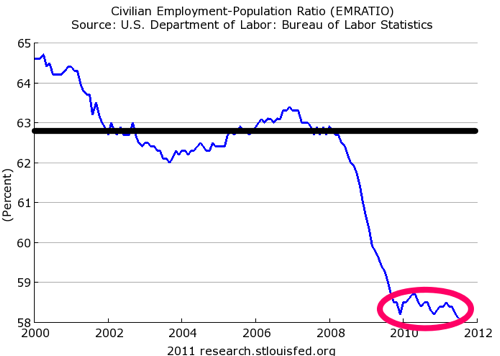 In sum, US unemployment jumped to 10%, then stabilized, sticking at around 9% since. To many, including Republican leaders and many finance ministers around the world, this outcome means that stimulus spending has failed and doing more stimulus will only make matters worse. So stop already! However, if the actual stimulus spending in the US was only half of what theory says was needed, why conclude that stimulus failed? Think about this example. It is just as if your house was on fire, and the fire department brings one truck (thinking it is only a one-alarm fire), sprays your house with water, but that volume of water is only enough to damp down the flames, not put them out entirely. Do you conclude that spraying water failed to douse the flames entirely, and therefore was an ineffective response to the fire? Do you then send the truck away (“it didn’t work, the fires are still smoldering”) and tell the Fire Department not to send another truck? Or isn’t the sensible thing to do to yell “MORE WATER” and say “it’s a two-alarm fire, we need more water, send another fire-truck” and then use both trucks to put the fire out? The economy got an apparent boost in 2009-2010 for two reasons, neither of which will continue. First, the stimulus included a housing purchase bonus that briefly pushed up housing prices and restored some activity to the housing/construction sector. As soon as that element of the stimulus expired, however, housing prices did a double-dip and have continued to stagnate or fall. As my last post noted, some housing markets have hit new post-crash lows. Second, corporations were initially able to boost profits by cutting their wage bill by laying off workers but maintaining output by pushing workers harder. This meant corporations were forced to get lean, did so, and made profits which showed up as growth. But that is over too. The boost in productivity that appeared when workers were layed off but output maintained was a one-off; they can’t fire more workers without cutting output, and they can’t boost output significantly without more workers. But since the economy is flat-lining, they are not interested in increasing output. So there we sit. So yes, productivity ticked upwards from early 2010 to early 2011; that’s what happens when you lay off workers but maintain output. But in the 2nd quarter of 2011, productivity fell by the same amount; so we’re going backwards. High and stagnant employment levels and falling productivity is where we are now — sounds like a depression to me. It’s a shame that everyone’s dead-set against sending that second truck. I’ll immediately grab your rss feed as I can’t in finding your e-mail subscription hyperlink or newsletter service. Do you’ve any? Please permit me know so that I may subscribe. Sorry, you have to use the rss feed, or connect to me via Linked in. But whatever works, glad to have you reading! What i do not realize is actually how you are not really much more neatly-favored than you may be right now. something to do with Girl gaga! Your own stuffs excellent. Always handle it up! I think what you said was actually very logical. However, think about this, what if you composed a catchier post title? I ain’t saying your information is not good, but what if you added a headline that makes people desire more? at Yahoo’s front page and see how they create post headlines to get viewers to open the links. You might try adding a video or a picture or two to grab people excited about what you’ve written. Just my opinion, it could make your blog a little bit more interesting.